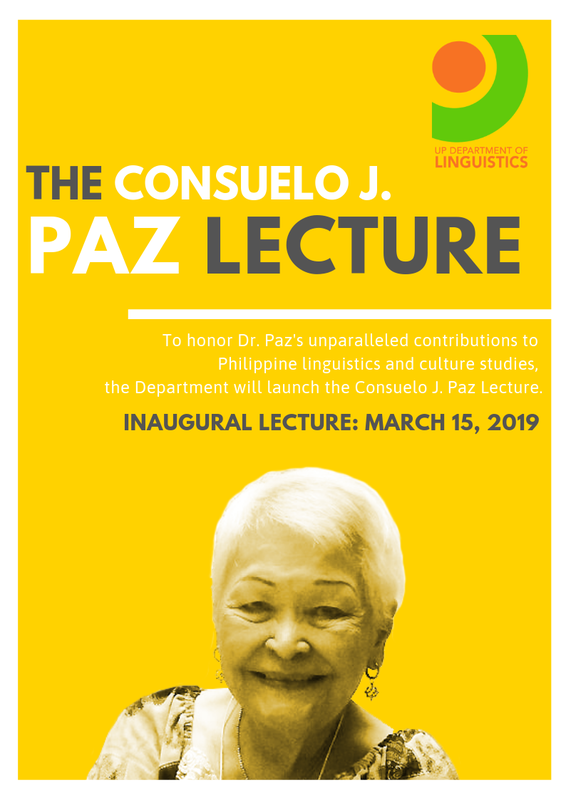 Everyone is invited to attend the Inaugural Consuelo J. Paz Lecture, to be held on 15 March 2019 (Friday), at Palma Hall Rm. 207, 1:00-3:00 p.m. This biennial event is launched by the UP Department of Linguistics to honor Dr. Paz’s unparalleled contributions to Philippine linguistics and culture studies. It is also one of the major activities to be held as part of the upcoming centennial celebration of the Department in 2022. Assoc. Prof. Jesus Federico C. Hernandez will deliver the inaugural lecture entitled “Atay, The Heart of the Matter.” Prof. Viveca V. Hernández will also share her recollections working with Dr. Paz as her colleague, teacher, and mentor. Dr. Paz may be considered as the “Grand Dame of Philippine Linguistics,” having published numerous pioneering works on historical and comparative linguistics as well as sociolinguistics and ethnolinguistics, which up to now have been read and cited by linguists, language planners, and Austronesianists in the Philippines and abroad. She served as Dean of the College of Social Sciences and Philosophy at the University of the Philippines Diliman, and was instrumental in strengthening the connection between the scientific study of languages and other disciplines in the social sciences. She initiated the Programa sa Pag-aaral ng mga Etnolinggwistikong Grupo, which conducted field work through the Philippines in order to gather linguistic and ethnographic data that produced an extensive range of studies on Philippine languages and cultures.